While waiting to board the Eurostar, I casually glanced at my ticket and found it extremely befitting that my coach and seat number together form 4’33”, echoing John Cage’s seminal work of the same title, since I would be spending most of this trip in solitary silence. If you’ve never travelled on your own before, I strongly encourage you to try it out at least once, because then you’ll end up noticing things around you that you wouldn’t otherwise notice if you’re entertaining company, and you somehow come to appreciate the city more… or end up falling head over heels in love with the city. After spending most of the journey asleep, I wake up to find myself in Paris, and it’s a surreal experience. Stepping out of the Gare du Nord, I am almost immediately accosted by a young woman asking if I speak English while waving some sort of petition in front of my face. Being suspicious, I say nothing and ignore her, all the while clutching my coat containing my valuables tightly, although she persists for quite some time until I quickly walk past her and blend in with the rest of the crowd. It is only later that I find out that she is a pickpocket, and that this is the mode of operation used by the pickpockets in Paris. In my few days in Paris, I am accosted no less than 10 times, probably because I resolutely do not look like a native, and possibly because I only speak a smattering of French, so the only thing I am able to say to them is “Arrêtez, s’il vous plait!” in the most annoyed tone I can muster. That said, I wonder why they don’t employ other means of scamming people, since you’d expect that most people would quickly come to realise that they ought to walk away quickly when approached by a young woman waving a paper and pen in their faces. A creative suggestion, if they ever read my blog (although I highly doubt it): how about wearing some perfume to attract people, and then selling them a knockoff? (By the way, I’m not promoting crime in any way, just writing down my rambling musings). But I digress. After leaving my luggage at the hostel (too poor to afford a hotel, plus I wanted to spend the money on perfumes instead), I hopped onto the métro towards St. Michel. Upon boarding, I came across a homeless man whom everyone was avoiding because well, he smelt like he hadn’t washed in ages (poor dear); it was however heartwarming to see that someone sitting opposite him gave him his packed lunch, tupperware, spoon and all. At times, the smell was unbearable, so I turned my head in the opposite direction, where I caught whiffs of a spicy amber perfume wafting from a young lady – I probably should have asked her what she was wearing, but I didn’t know how to do so in French, so I shall have to live with just the memory of the smell… but hey, even a simple métro ride was quite the fragrant experience in and of itself. 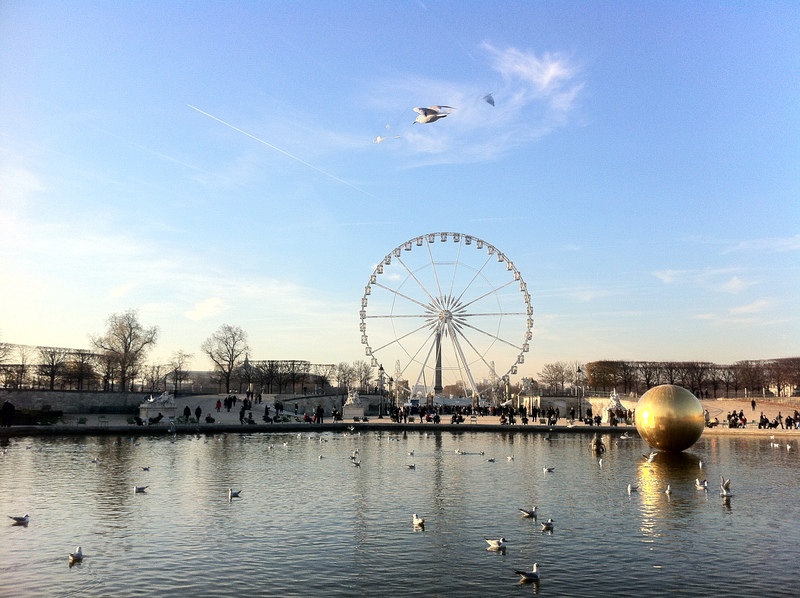 Being unfamiliar with Paris, I had decided to embark on a free walking tour to familiarise myself with the major attractions in the city, and also to get them out of the way. The tour began at Place St. Michel, and it was there that I noticed a couple intertwined in a passionate makeout session that lasted for what must have been more than 10 minutes while tourists all around snapped pictures of them, to which they were oblivious. That got me wondering: if they were wearing perfume, what would it be? Of for that matter, would there even be a perfume that gets one all hot and bothered? 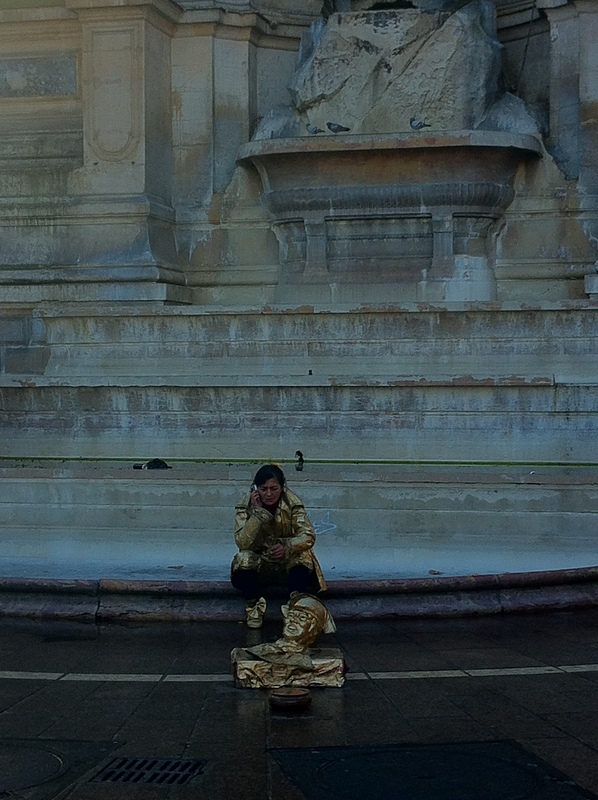 Over on the other side of Place St. Michel, I somehow managed to take a picture of one of the street performers taking a break and having a smoke. I thought the picture looked like the kind someone would include in a photography magazine, so I’ve included it here on a whim, in the faintest hopes that the photo will somehow become famous in future. And then the tour started, with Arnaud, who was originally from California (he’d gotten his French girlfriend pregnant, and they’d gotten married and moved to Paris), as our tour guide. He warned us about the pickpockets, musing, “What’s the point of living when you have no belongings?”, which got me thinking what would happen if one day I woke up to find my entire perfume collection gone. Horrors! I’m not sure yet how I would deal with such news. As Arnaud explains the significance of the hooves of the horses upon which sit famous people (all hooves on the ground means the person died of natural causes, one front hoof and one back hoof curled up means the person died of unnatural causes, two front hooves raised means the person died a triumphant death in war), I am suddenly squirted in the face by apple juice. It turns out that the guy beside me had squeezed his apple juice carton a tad too hard. Well, I must say that the apple juice wasn’t as bad as DKNY’s Be Delicious fragrances. 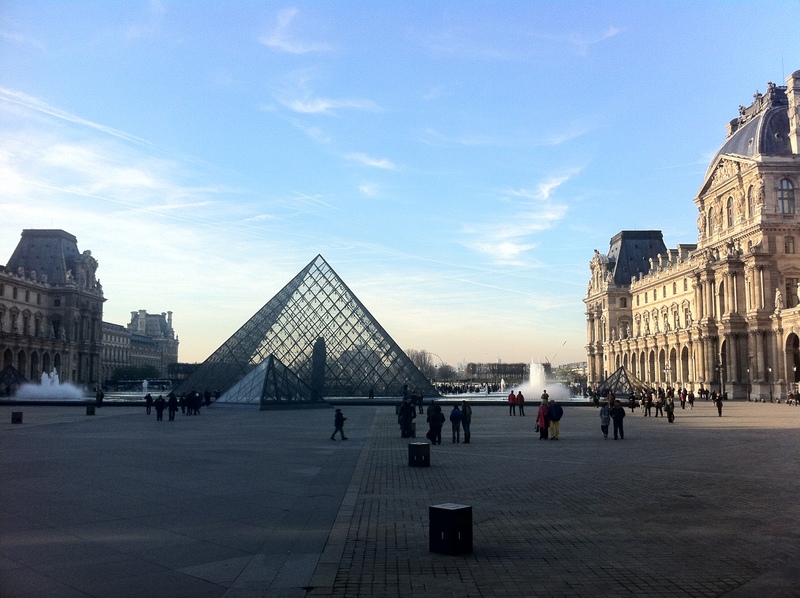 We walk along the River Seine until we arrive at the Louvre, and I proceed to take a customary shot of the Pyramid that guards the main entrance to the Louvre. Honestly, though, the modern steel and glass construction looks very out of place when juxtaposed against the royal grandeur of the palace itself. But, when one considers the history of the palace and how its extensions took on the architectural styles of each period, from Gothic to Renaissance to Baroque, and then Neo-Classicism, etc. etc., it suddenly seems only natural that each period will add its own imprint on the Louvre. I wonder, too, if this is perhaps the case with perfumery, with new, conceptual brands such as Blood Concept springing up to make their mark in perfume history (or not, who knows?). 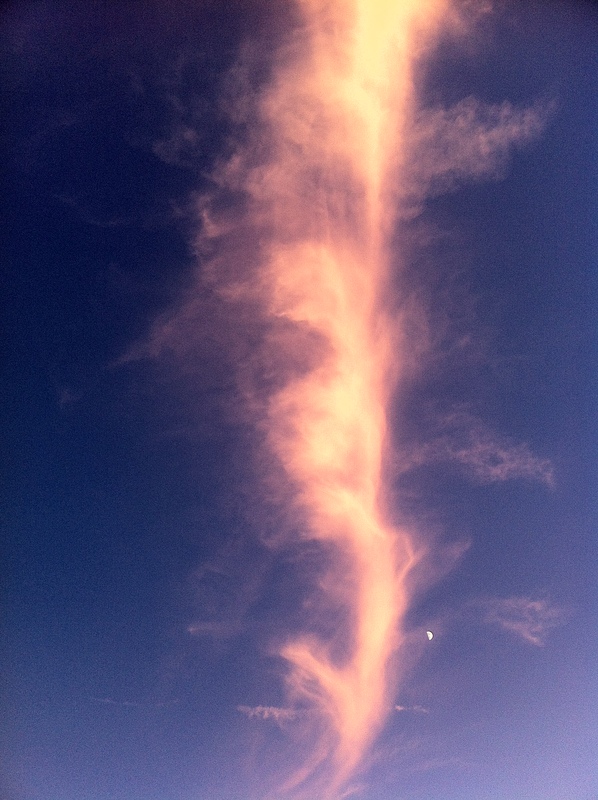 Perhaps one day peoples’ tastes will change and they will start finding metallic notes in their perfume palatable. But this talk of the history of perfume could fill the pages of a PhD student’s proposal, so I daren’t venture into that area. Strolling into the Jardin des Tuileries, I am floored by how beautiful symmetry is, each tree mirrored by another tree, each fountain mirrored by another fountain. The only asymmetry comes from us people moving as and where we choose. And yet what good would the gardens be without flawed beings to perceive them? I know, I know, I’m coming across as being pseudo-philosophical, but these thoughts really did cross my mind during my holiday, so you’ve got to bear with me! The walking tour ends at the Place de la Concorde, and I make my pilgrimage up the famous Champs-Élysées, although my goal is really the Guerlain boutique at 68 Champs-Élysées. After an exciting time looking for a restroom to relieve my rather full bladder, which involves me popping into an Annick Goutal boutique to ask for directions in faltering French, then queuing up for ages in a crowded Brioche Dorée, I finally make it to Guerlain. I took a picture of the external façade, but deemed it inappropriate to snap away in the boutique itself, so I have to leave you with a picture taken from another source. Inside, the latest release, Le Parfum du 68 Eau de Parfum, which was created by in-house perfumer Thierry Wasser, is prominently displayed on the glass and marbled tables. Initially, I spritz with trepidation because the sales assistants are glancing at me occasionally while chattering amongst themselves, but when they realise that I am trying out quite a number of fragrances, they politely ask if I need assistance. Preferring to be left alone, I inform them that I’m good for the moment, then resume my sniffing of Le Parfum du 68. It’s rather meh, actually, coming across as a marshmallowified (new word!) sweet floral that really isn’t much to scream about. Fragrantica states that “The fragrance features spicy notes, immortelle, tonka bean, benzoin, incense and leather”, although I get none of these, save maybe for a little tonka bean. The sales assistant whom I ask about notes tells me that there are notes of “hot and cold spicy”, which is an effort to look forward to the future while retaining some of the past. Errr, confusing much? And I shudder to imagine what Guerlain’s future would smell like based off of this latest release. If you were expecting something ground-breaking, think twice about actually putting in the effort to try Le Parfum du 68, for it merely echoes what has been done countless times on the market. Think Maison Martin Margiela’s Funfair Evening, but tone down the ethyl maltol. I mean, give me a bottle and I might wear it, but at the whopping price of €195 (or €180, I can’t remember exactly), it feels somewhat like a release designed just to conjure up some money. I’m a huge Guerlain fanboy, and quite the opposite of penurious when it comes to spending on Guerlain fragrances, but this release thoroughly failed to move me to part with my money. Additionally, being a Vagabond, I was lamentably impecunious on the Euro front, and so swiftly decided to hold on to my limited supply of euros for better fragrant offerings. 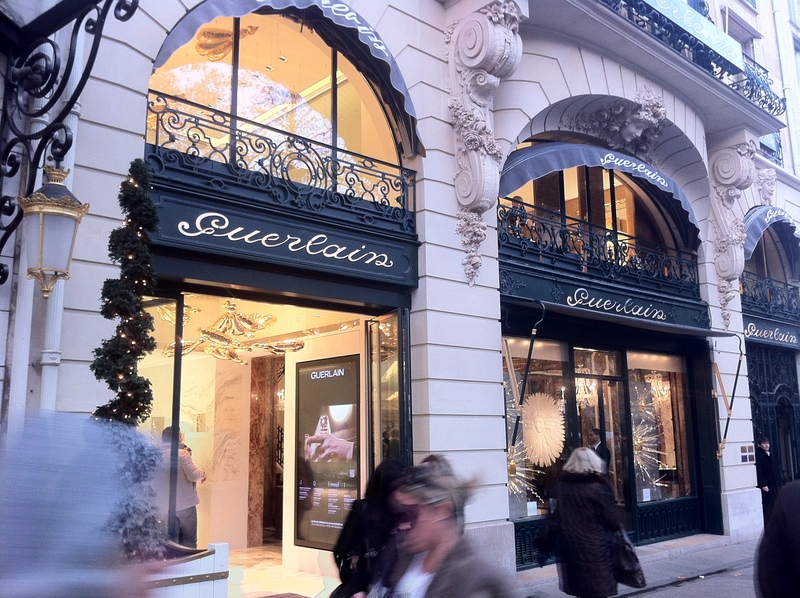 Leaving Guerlain somewhat disappointed, I continue up the Champs-Élysées towards the Arc de Triomphe. 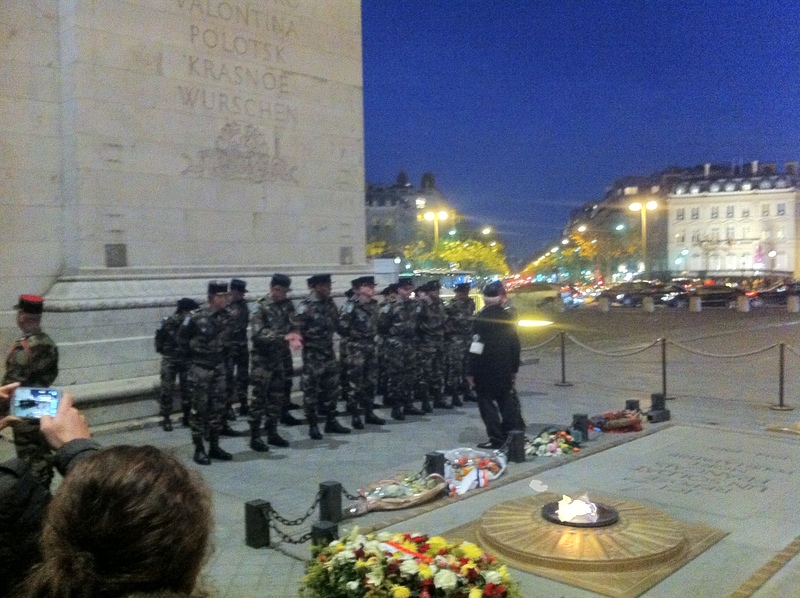 There, I catch a glimpse of the eternal flame meant to honour the death of the unknown soldier. It is a sobering time for me as I reflect on the state of the world… and then I’m climbing 284 steps to the top of the Arc de Triomphe, which is really good exercise, panting as I reach the top. 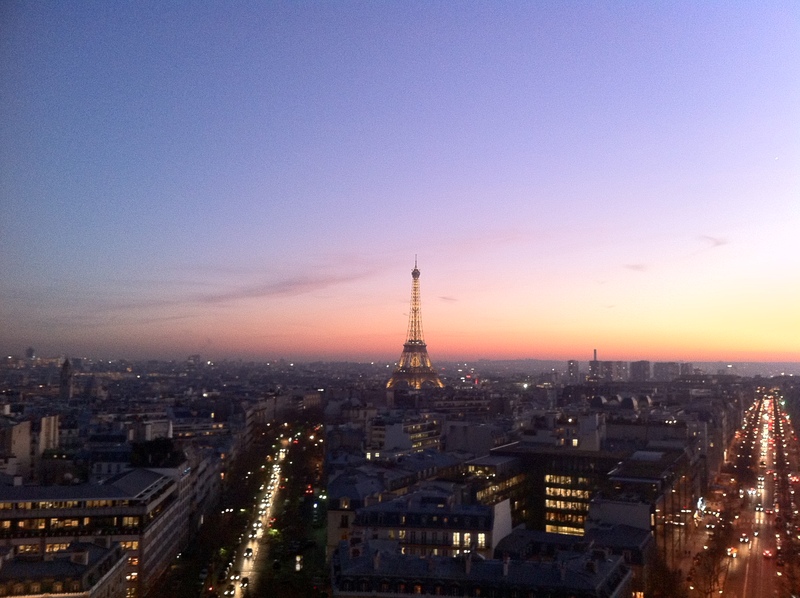 The view of dusk in Paris is breath-taking, as the photos will show you. I took a photo of the Eiffel Tower standing proudly over the rest of the city, but really I marvel more at the beauty of the sky and the colours that fill it. 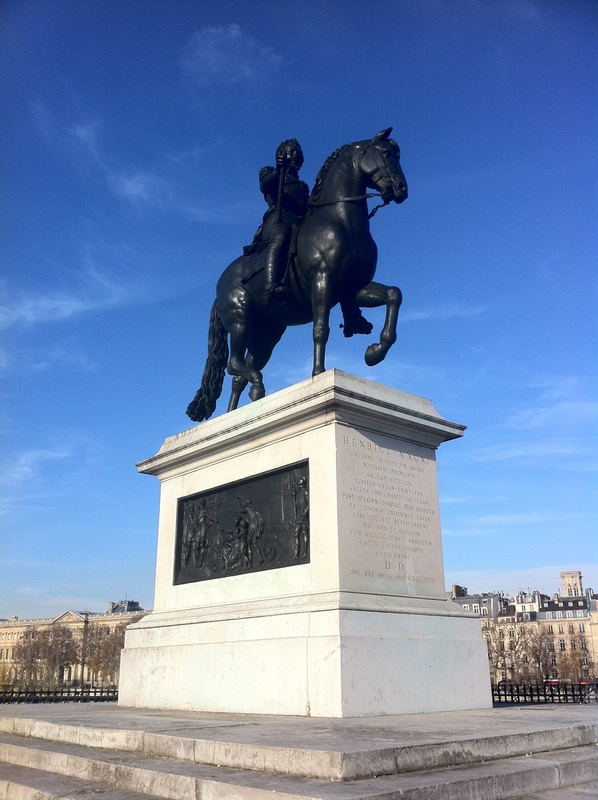 Click here to go to Day 2 (Part I) of my adventures in Paris!
. 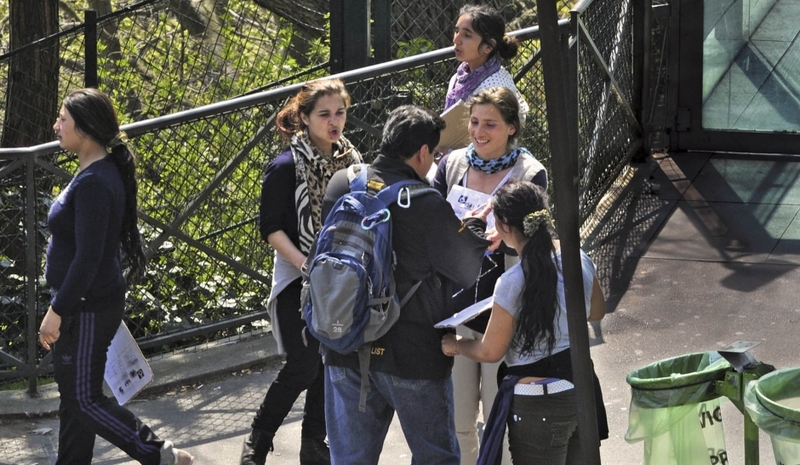 Can I ask you which walking tour you took? I am taking a friend to Paris in Feb and he has never been and I thought about a walking tour but had no idea where to look. You have made me VERY sad that 68 is meh, I love the EdT so much. Did you happen to try Mon Precious Nectar? Thanks for popping by! 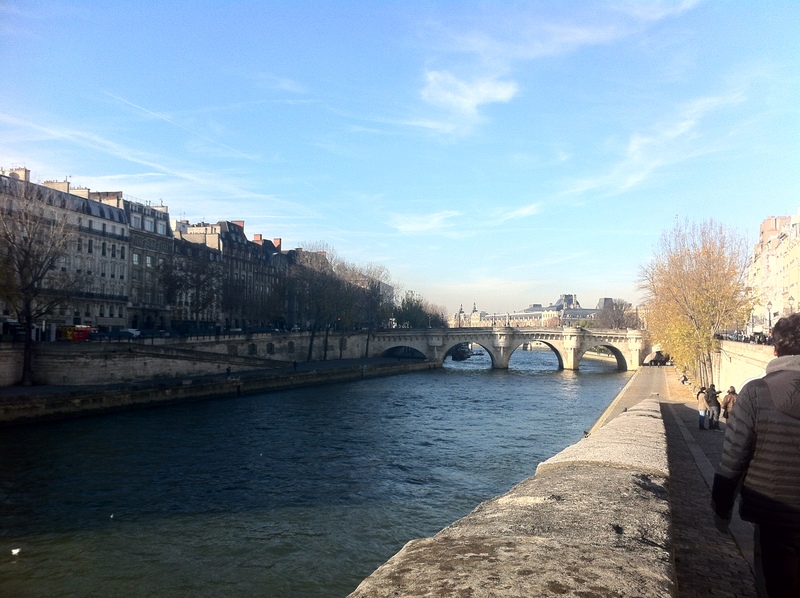 I took the free walking tour by Sandemans – it’s the New Paris tour. I found it slightly too slow-paced, but quite informative. It’s actually possible to explore Paris without relying on a tour, in my opinion, and that might actually be part of the charm – getting lost! I didn’t try Mon Precieux Nectar this time round because I’d already tried it back in Singapore. It’s sweet, floral, but not particularly exciting. I would by far recommend Miel de Bois by Serge Lutens if you’re looking for something that truly represents honey. Yes, you’re right. Paris as a free agent is fun but there are a few marks I definitely want him to see on our day for wandering. If I don’t make sure we do SOME sightseeing, and I think a formalised one, it will all be frag oriented and then he will feel like he missed Paris. How lovely. The Dandy lived in Paris for a short while many moons ago and makes it a point to return at least annually everything being willing. I agree, to a degree, about the sweet notes that dominate some Guerlain exclusives; however, did you try the Les Parisiennes and Les Eaux, both ranges that can be difficult to come by elsewhere. Here impossible to find (near) lost classics reside in the form of Liu or Vega or Sous Le Vent or Derby. These tiny re-issues make the trip to Paris worth it almost in their own right. So looking forward to the next episode! Did you make it to Serge Lutens? Or the great perfume Mall that is le Marais? Ohhh that’s really lovely! I wish I could go back to Paris every year. I’ve tried both ranges, they are available in London and in Singapore too. As for Vega and Sous le Vent, I liked them but found them to be weaker clones of classics already on the market, the former being a clone of Chanel No.5 and the latter being an insipid version of Diorella. Pretty, but they didn’t blow me away. As for your other questions, they’ll have to wait for the next few posts! Interesting take on Vega and Sous le Vent. Obviously the aldehydes of the former mean it has a passing resemblance to No. 5, but I find it much more akin to vintage Arpege or even First but with a greater softness, probably the liberal use of sandalwood. As to Sous le Vent, not sure it could be described as a ‘clone’ of ‘Diorella’ being nearly 40 years its senior. Also the uniqueness of the tarragon opening and the broadening out to a very controlled but elegant floral heart over one of the most subtle uses of oakmoss ever in perfumery establishes it as a masterpiece, to my mind. I can, now you mention it, see that the way in which the famous honeysuckle in Diorella is utilised has some similarities, but other than that, the obvious compositional qualities of the class and the fact they are both brilliant scents I wouldn’t have bracketed them together particularly. I didn’t mean to relegate Vega and Sous le Vent to the murky depths of condemnable perfumes. I suppose I was enunciating their similarities to other contemporary fragrances, and I found these similarities to be too striking to make it worthwhile to purchase them at their current prices. You’d have to pardon my harried comparisons for I formulated these thoughts during my short time in the boutique itself. It is also possible that Vega and Sous le Vent today, post-reformulation, are shadows of their former selves, although I do not have a vintage version with which to compare them. Perhaps we ought to do a side-by-side test! I really enjoyed your Travelogue-with-Perfume post, my dear Vagabond! And I couldn’t agree more on the issue of Guerlains. I haven’t liked or been impressed with a single — SINGLE — one from the higher, more exclusive, more expensive “niche” lines. Not L’Art et La Matiere, the Arabian one, the Charnels Fatals, or any of the others. The only modern, post-2000 Guerlain I like is the L’Instant Pour Homme Extreme/Eau Extreme/LIDGE. As for post-2000 Guerlains, I didn’t mind Insolence, which was created by Maurice Roucel. Despite its stupendous RED BERRIES explosion approach, it is coupled with something sensual in the background. I just make sure that I spray it on at least an hour before leaving the house. I am completely in love with that city and I did get a chance to enjoy it myself (I was there on business for two weeks). Thank you for stopping by and I’m glad you enjoyed reading it. I always love reading posts about the scented adventures people have in Paris and never seem to be able to read enough! Did you buy any perfume when you were in Paris? I had to google the meaning of ‘corker’. Well, thanks! I did think it was worthy of a slot in one of those sleek magazines.